“Slow slip” events are earthquakes that take days to weeks to happen (thus ‘slow’ compared to regular earthquakes that happen in seconds). Slow slip was discovered 10 years ago by scientists studying plate tectonic movements in Washington state and British Columbia. They used GPS to measure crustal motions, and observed that the Pacific Plate was pushing the North American Plate eastward. This indicated that instead of the Pacific Plate smoothly gliding beneath North America, that the plate interface between the Pacific and North American plates was stuck, and they were moving together. Unexpectedly, they also observed that every 15 months or so the GPS motions would reverse direction and the GPS monuments would move west. This was interpreted as being due to the North American Plate becoming un-stuck from the Pacific Plate and slipping back to the west. These periods of reversal take about 2 weeks to happen, and are called slow slip. Before the discovery of slow slip it was thought that the plates could only become unstuck during earthquakes, and that large earthquakes would be needed to account for all of the plate motions. The slow slip events are often the equivalent of a magnitude 6 or 7 earthquake, but since they take 2 weeks to happen, no one feels them. A crane lifting a seismometer and absolute pressure gauge. Photo: Jenny Nakai. Why do we care about slow slip? 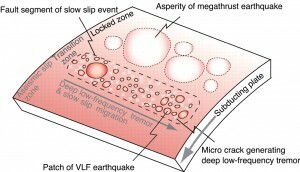 An example of the three slip zones of a subducting plate. Understanding slow slip can help us understand earthquake processes, particularly at plate convergence zones where huge earthquakes are possible. The ‘megathrust’ earthquakes that happen at subduction zones can generate tsunamis and are a large threat to coastal communities. Knowing tectonic plate motion rates we can make estimates of the earthquake moment release (cumulative energy release) expected in a region. But slow slip indicates that earthquakes are just part of the story, and that the energy release associated via slow slip should also be accounted for. Some studies have suggested that slow slip may precede large earthquakes, but more study is needed to confirm that hypothesis. 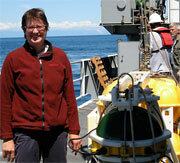 We are studying slow slip at the Hikurangi subduction zone offshore the east coast of the North Island of New Zealand. At the Hikurangi subduction zone the Pacific Plate dives beneath the Australian plate at around 4.5 centimeters a year (seems slow but for geology that is fast). 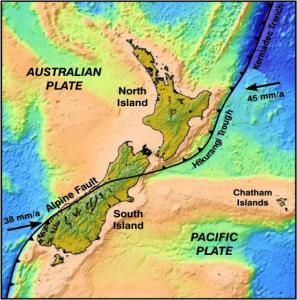 New Zealand, and in particular the Hikurangi margin, is a great place to study slow slip because large and fairly periodic slow slip events have been observed here, there is an excellent network of seismic stations and continuous GPS stations on-land, and the offshore part of the Hikurangi subduction zone is close to shore and not very deep. 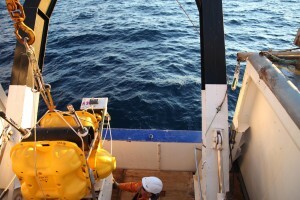 Thus with an ocean bottom seismic and seafloor pressure experiment one can get right on top of the slow slip zone and be better able to study it.